India batsman Virender Sehwag, who underwent surgery on his injured shoulder in London last week, is likely to be fit for India's upcoming tour of England. "I think I will able to play the series in England," Sehwag told Mid-Day. "That's the reason why I stopped playing the Indian Premier League for Delhi Daredevils and rushed to London to get my shoulder operated." Sehwag picked up the injury, a slap lesion or labrum (shoulder blade) tear, during the 2009 IPL, and did not play a single game during the World Twenty20 in England. He also missed the one-day series in South Africa in January this year on account of the injury. He was declared fit in time for the World Cup but did not bowl during India's victorious campaign. Sehwag played 11 games captaining Delhi Daredevils during the current IPL season but took the decision to withdraw from the tournament to undergo shoulder surgery in England after his side's loss to Mumbai Indians on May 7. The 32-year-old Sehwag was operated upon by Dr Andrew Wallace, whom he had consulted earlier in 2009. The London-based surgeon Wallace had also worked on Sachin Tendulkar's tennis elbow. "I will return to London after six weeks for a check-up," Sehwag said. "I should be fit in six to eight weeks. Going by the rehabilitation programme designed for me I should be okay. I am already feeling the difference each day." 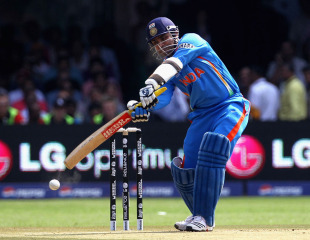 Sehwag was expected to return to India late on Monday night. He has already been ruled out of India's tour of West Indies that begins on June 4. India then go on to play four Tests and five ODIs in England, with the first Test beginning at Lord's on July 21.